Rieger Tuning offers combination of German ingenuity and design excellence to produce elegant aerodynamics tuning for Audi, Mercedes, BMW, Volkswagen, Ford, Porsche, and Japanese cars. 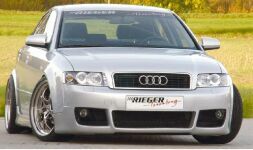 Global Autoshop exclusively carry full line of Rieger Tuning aerodynamics. Please contact us for more information.